High refresh rate gaming has been swiftly gaining in popularity over the years, but more often than not, making the jump to 144Hz is an expensive endeavour. Fortunately, we are starting to see more budget-friendly options hit the market, including AOC’s latest ‘G90’ monitor, which sports a 144Hz refresh rate and a 1ms response time for £219. We first saw the AOC G90 range in February, consisting of three models delivering 60Hz, 75Hz and 144Hz options. Now, AOC is bringing another option to the table- the AOC G2590FX, targeting those on a tighter budget. The monitor has a 24.5” TN panel boasting a 1ms response time, 1920×1080 full HD resolution, 144 Hz refresh rate and with AMD’s Radeon FreeSync technology incorporated. With all of that combined, PC gamers can enjoy silky smooth visuals without any unsightly tearing or stuttering issues. Specifications also include much-improved viewing angles (170°/160°), 400 cd/m² brightness and the inclusion of ‘FlickerFree technology’ and ‘Low Blue Light’ mode for a more comfortable gaming experience all around. The slick 3-sided frameless design gives the monitor a real premium finish that we don’t often see on budget-oriented gaming displays. It also paves the way for seamless multi-monitor setups. The stand offers tilt adjustment from -3.5° to 21.5° but the display also comes with standard 100x100mm VESA mounting, so you could easily take if off and put it on a third party monitor arm, or wall mount it. You’re not left wanting for connection choices either, with the G2590FX offering VGA, DisplayPort 1.2 and 2 x HDMI 1.4 inputs. Like the rest of AOC’s G90 monitor range, this screen also comes with various eco-friendly certifications too. AOC has made this feature-rich yet wallet-friendly gaming display available at an MSRP of £219. It already seems to be available at UK retail, with some even offering it for under the MSRP price! Of course, you will need an AMD graphics card to make use of the FreeSync technology though. 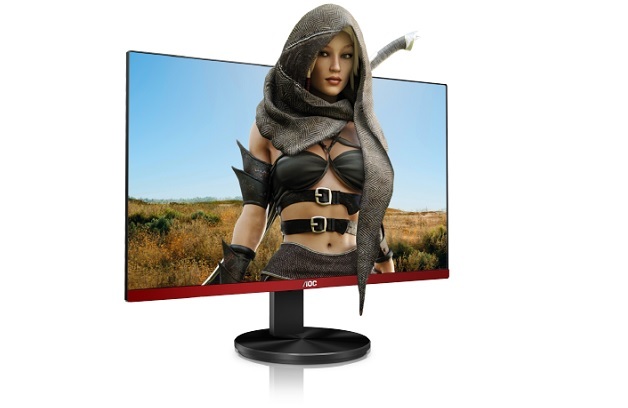 KitGuru Says: AOC is a respected global brand in gaming monitors and this latest addition to the G90 family is packed with specifications and features that are desirable to many PC gamers, particularly at this price point. Would you be interested in picking one up?